This Instant Pot Pork Tenderloin with Black Beans and Coconut Rice is so easy in an Instant Pot. It all cooks together and the spices and the coconut give everything such a fantastic flavor! Just like pizza and popcorn, rice and beans is something that I could easily eat every day. It’s so homey and comforting. Simple, classic food. I used to make it by slow cooking beans all day and then cooking rice and serving the beans on top of the rice. 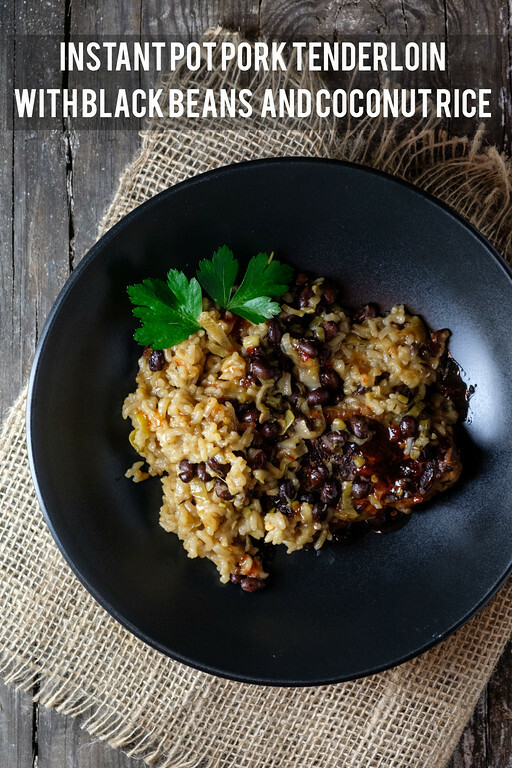 Since I got an Instant Pot, though any electric pressure cooker can be used, I’ve fallen even more in love with rice and beans. Click here to pin this Instant Pot Pork Tenderloin with Black Beans and Coconut Rice! 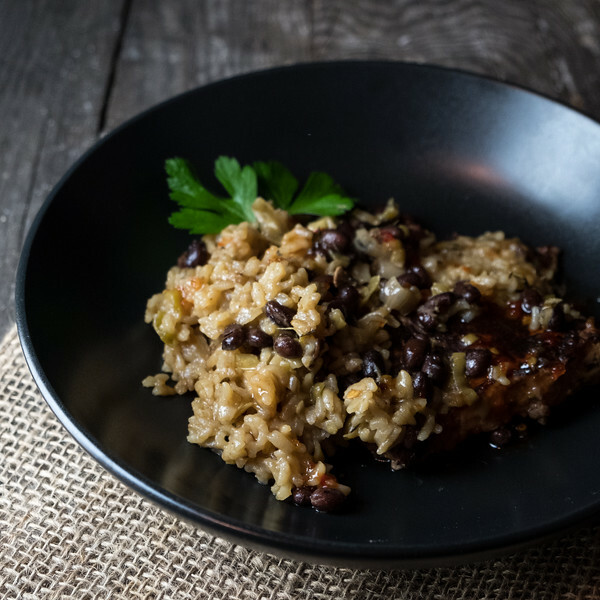 This Instant Pot Pork Tenderloin with Black Beans and Coconut Rice all cooked together in one pot. So, the flavors mingled perfectly. An electric pressure cooker seems to infuse every single ingredient with all of the spices and flavorings used. Things taste like they’ve cooked all day, without having that cooked all day tiredness that they can get. This dinner can be on your table in less than an hour. You simply brown the pork, saute the leeks and chiles with spices, add everything to the pot and cook at high pressure for 15 minutes. While it’s coming up to pressure, you have time to make a side salad and even enjoy a glass of wine. The electric pressure cooker makes it so easy. I found this recipe in my go to pressure cooker cookbook: The Great Big Pressure Cooker Book. Pork Tenderloin and black beans cook all together with rice and coconut milk in this easy one pan meal! Heat the oil in the pressure cooker turned to the saute setting. Add the pork and brown on all sides, about 6 minutes. Remove and let rest on a plate. Add the leeks and the chilies. Cook about 2 minutes, then stir in the thyme, cumin, coriander, salt and pepper. Cook until fragrant about 30 seconds. Add the beans, broth, coconut milk, rice and brown sugar. Stir to dissolve the brown sugar. Add the pork back to the pot and pour any drippings from the plate back in the pot. Try to make sure the rice and pork are covered by the liquid. Lock the lid on the pot, set the valve to sealing and set to cook at high pressure for 15 minutes. Use NPR for 5 minutes and then do a quick release. Leaving the lid on the pot, let the rice steam for about 10 minutes. Prep for this recipe was great and I had high hopes for it. In the end, it lacked flavor and was all pretty much gray in color. Sadly, I won’t be adding this to my Instant Pot favorites. I’m sorry it didn’t work for you. I need to make this again and see if I need to change it up a bit. I don’t really like pork tenderloin part but I believe this dish will be great! Thank you for sharing the recipe! Gotta try it soon. I just pinned your wonderful recipe, what a great meal for the Instant Pot. Your post is awesome and thanks so much for sharing it with us at Full Plate Thursday. Have a great week and come back to see us real soon! What does “Use NPR for 5 minutes” mean, Pam? Also, I’ve never bought coconut milk (I know!! ), but I’m assuming it’s unsweetened? Oh yum! This looks super delicious! I don’t have an instant pot yet, but I’ve been pinning recipes to a folder for when I do! I love one pot meals, and have yet to try cooking rice with the rest of the food in my Instant Pot. Definitely adding your Instant Pot pork tenderloin to my meal rotation. Love the coconut milk in it! Ooh this looks so flavorful and delicious! I always love more ideas for using my Instant Pot! What a yummy dish. I love all things pork.